Whether for a wedding, engagement, cocktail, these small fascinators bring a boho-chic touch of elegance to your outfit. The Brown version: little pillbox hat fascinator made in two shades of Brown braided straw cellulose and natural. Its diameter is 14 cm / 9 cm and a 7 cm hair clip keeps well it over the head. 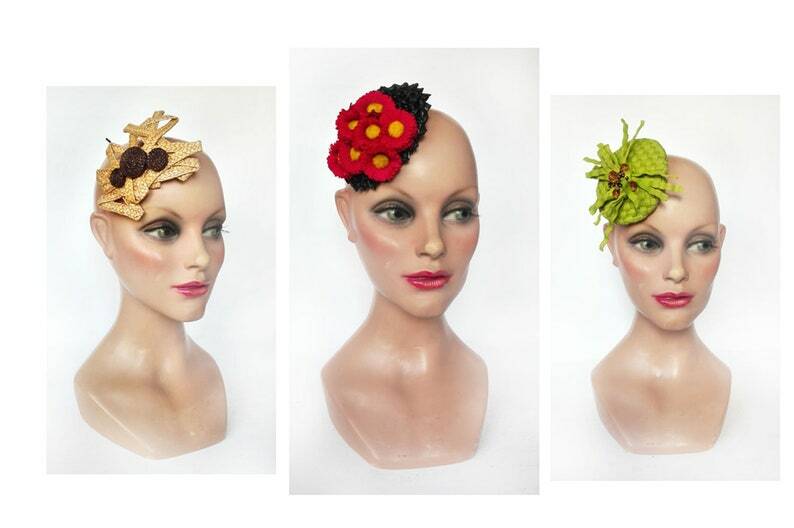 For the Red version: small hat made of natural black novelty straw braid and flowers in red fabric and yellow heart. The diameter is 11.5 cm and a metal hair comb of 4 cm allows the maintenance. For the green version fascinator made from woven straw, viscose and yellow-brown beads. The diameter is 10 cm and a comb allows you to position. Unique pieces and the dispatch is followed in a box envelope.